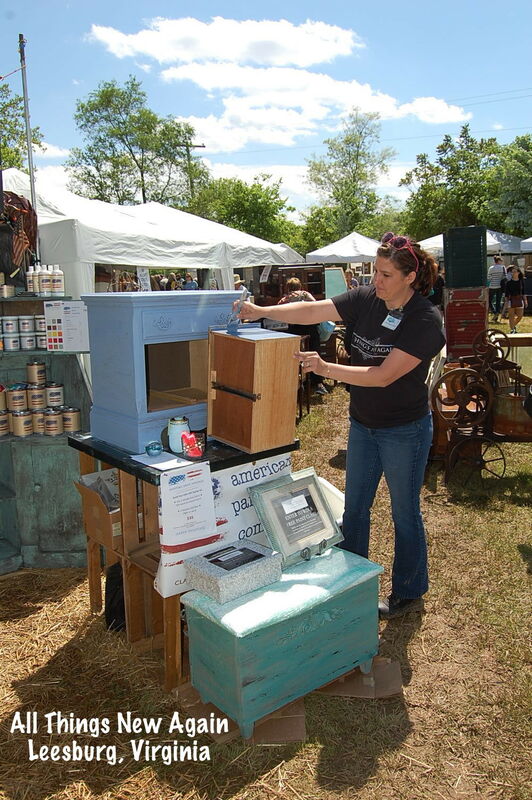 What makes the Lucketts Spring Market so awesome? Oh sure, there’s all the beautiful furniture and the vintage home décor and the really funky one-of-a-kind finds. All that stuff was great. 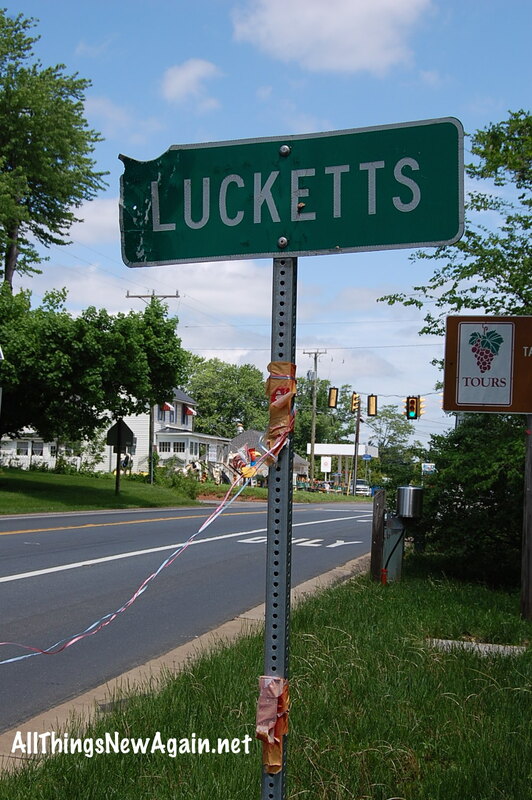 So what makes the Lucketts Spring Market so awesome? We had so much fun out in that muddy ol’ field last weekend because we kept running into our friends—and making new friends along the way. 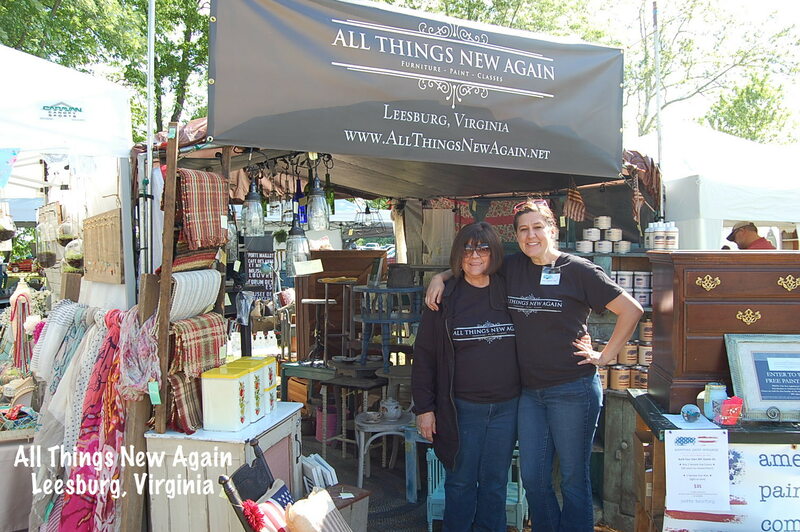 Thank you to everybody who stopped by our booth at the show—and to everybody who visited our shop All Things New Again in Leesburg. Here’s a picture of Mom and me in front of our booth. Do you love our All Things New Again t-shirts? Those were my sister Colleen’s great idea for a Christmas present last year. She even had little ones made for the kiddos. I spent the weekend painting and answering questions about how to paint furniture. I LOVE talking about painted furniture. I tell people how the paint lines we sell at All Things New Again have no stinky fumes and ZERO harmful chemicals, how it is so healthy and safe that I paint on my kitchen counter while my little boy plays Legos on the floor. Then (after I step on a few Legos and say some bad words) I just wipe off my counter and make lunch. No worries. I also tell people how EASY our paint is to use. No stripping. No sanding. No priming. No problem! Just shake the can, open it up and start painting. On Sunday I was working on an old yellow Ikea-like chair. 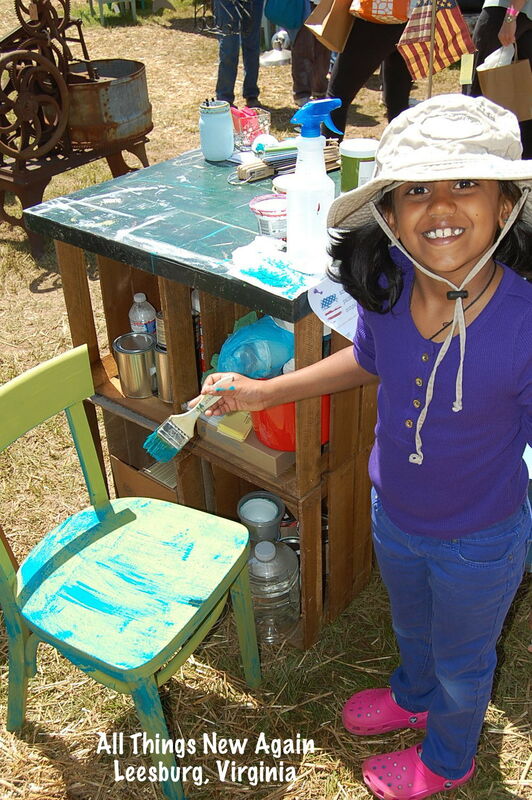 I had already basecoated the entire chair with a funky lime green color when my parents’ next-door neighbors arrived with their 8-year-old daughter, Chetana. Chetana wanted to help me paint so I opened a can of Peacock and handed her a brush. She applied the paint with a light hand so lots of the green showed through the teal. Here she is at work. I was stunned. How does a second grader know about dry brushing? “Cathy-Auntie taught me!” she said. It turns out my Mom explained the dry brushing technique to Chetana’s dad when he was painting the cabinets in his daughter’s bathroom a few months ago. Chetana was listening—and paying attention—because she ended up helping with her cabinets and with my chair. Chetana is a wonderful artist! So now, thanks to Chetana, I have a whole new approach to my sales pitch. The paints we sell at All Things New Again are so safe and easy to use, a second-grader can do it—and so can YOU! What do you think? Didn’t Chetana do a great job on this chair? Please leave a comment to let her know. Let’s all encourage each other here! We can teach you to be a great painter like Chetana! All Things New Again offers a full line-up of furniture painting classes every month at our studio in Leesburg, Virginia (about an hour or so west of Washington, D.C.) Check out our latest schedule of furniture painting classes.